This section of the documentation covers the steps required to get calibre2opds installed and running on your system. add the Java binaries install locationin the value field. It will vary according to where you installed Java, but is typically something like ‘C:\Program Files\Java\jre6.Press OK to accept the changes. You may have to press OK on several times to close down all the dialog.You can check your changes by starting a new Command Prompt window (it must not be an existing Command Prompt window as you need a new one to pick up the change you have just made). Typing SET PATH which will display the current setting of the PATH environment variable with all variables expanded. The path to the Java binaries should now be in the list if you have made the change correctly. The latest versions of calibre2opds that is available for download are shown Downloads page. A fuller list of downloads including old releases and beta builds are available at here. You should download the version that is appropriate for the system on which you wish to install calibre2opds. The ZIP file version does not include installation program and requires manual installation steps. This can be appropriate on systems where the system specific installer does not work for some reason. Go to the appropriate section for your operating system for more information on the steps needed to complete the installation. There appear to be problems running the Windows installer on 64-bit versions of Windows. This seems to happen if you are using 64-bit Java on 64-bit Windows. If you are using 32-bit Java then the Installer runs without problems. If you have such a problem then use the NOINSTALLER manual method based on the ZIP file. The main calibre2opds program is quite happy with 64-bit Java – it is only the Installer that doesn’t like it for some reason. 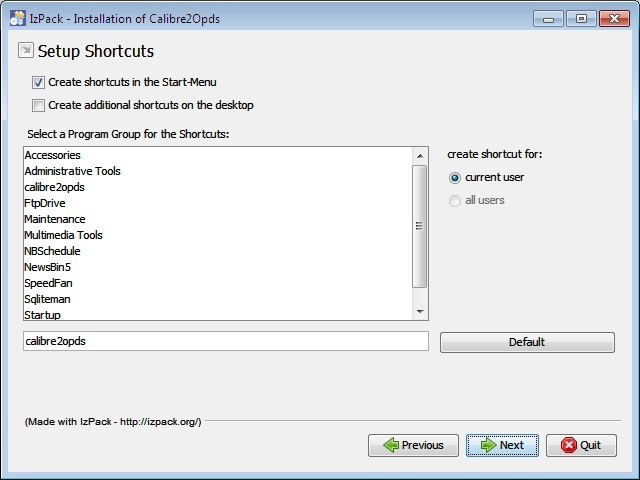 The following steps show installing using the calibre2opds Windows package calibre2opds. on a Windows 7 system. Some of the details will differ slightly on earlier versions of windows and the dialogs displayed in the screenshots could look slightly different. 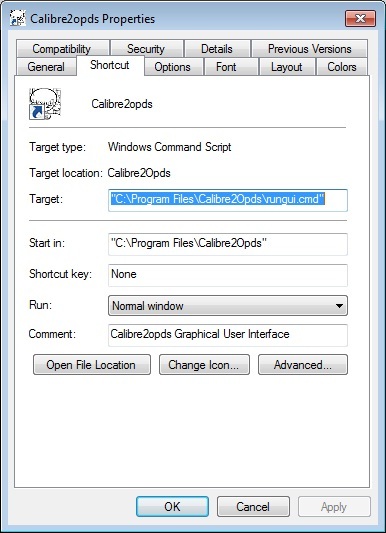 calibre2opds is supplied in the form of a Windows setup program. The exact name may vary according to the release, but is typically something like calibre2opds-2.2-WINDOWS.exe To start the install you run the calibre2opds-2.2-WINDOWS.exe file. If you have not got Java installed then you will get an error message saying that windows does not know how to handle this file type. When the install starts up if you are running under Windows Vista or Windows 7 you will get a warning dialog that looks like the one shown below. This is standard when installing software on Windows Vista or Windows 7. This dialog will not appear on Windows XP. 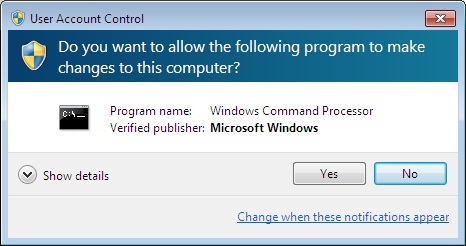 If you are running on Windows 7 and do not get this dialog, then you may have to right-click the .EXE file and select the “Run as Administrator” option for the install to be successful. 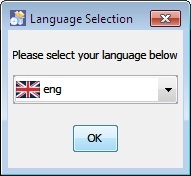 You are then asked to select the language to be used. Once you have done that you are shown the welcome dialog. Press Next to proceed. You are now shown the Release Notes pertinent to this release of calibre2opds. You are strongly advised to read them before you proceed. calibre2opds is licensed under the Open Software Foundation GPL license so this is displayed for you to read and accept. You need to accept the license before you are allowed to proceed. Press Next to accept the license. You are now asked to specify the install location for calibre2opds. If the default is not what you want change it to the desired value. Press Next to proceed. On Windows 7 and Vista you may get warnings about not having relevant access permissions to the folder that you have specified should be used for installing calibre2opds. If this occurs then create the desired program folder manually, and then set the access permissions so that ordinary users have Full Control. This is standard if you are upgrading calibre2opds. Press Next to proceed. Set them to the desired values. Press Next to proceed. If the option to set “All users” to have the shortcut is not selectable then this means you do not have Administrator privileges. Press Done to exit the installation program. calibre2opds is now installed and ready to be used. Run the install.sh script from the unzipped files. The dialogs that are displayed during the install will look like those shown for the Windows install below. As there are many variants of Linux, if you have any problems with the Linux specific install package of calibre2opds that is supplied, then you can try the Manual install method mentioned in the previous section which is operating system agnostic. Open the disk image and drag the application icon to your Applications folder. When running calibre2opds you may sometimes get an error message saying there is not enough memory to generate an image thumbnail. ( ajust memory values ( here 512 and 1024) if necessary. Execute again run.sh to build the OPDS catalog. If you did put your calibre library on a NAS disk, you should access your library using a file network protocole that supports locks. Otherwise calibre2opds won’t be able to generate the OPDS catalog. The following setup had been tested on Snow Leopard ( MacOS 10.6.X), using NFS to mount the NAS folder. Suppose your calibre library is on NAS folder called /DataVolume/bibliotheque , shared through NFS with read/write access granted to everyone without authentication. If you prefer to use a graphical tool to mount the share see  . Don’t forget to put locallocks in the options field. This version of the install should work on all systems, but it does require a number of manual steps and a little understanding of how to do things at the Operating System level. Unpack the calibre2opds ZIP file that has been downloaded to a folder of your choice. The calibre2opds GUI can now be started by running the appropriate rungui file. The rungui.cmd file should be used on Windows based systems, and the rungui.sh file on Linux or Mac based systems. These are simple text based command files so if you want to you can use a text editor to look at their (very simple) contents. You can then (optionally) set up a shortcut to run the calibre2opds program. The easiest thing to do is to set up a shortcut to the rungui files mentioned above to provide the appropriate setting for such shortcuts. On a Mac it is probably easier to start by doing an install via the dmg method, and then do an uPgrade via the method based on using the ZIP file. In most cases one can simply upgrade by following the same procedure that one used for your initial install of calibre2opds. However in some cases (particularily for test or beta releases) the full install packages are not made available. In such cases it is normally easy to upgrade an existing installation by using the ZIP version of the software. Download the ZIP version of the software to a know location on your computer. No special steps are required – the generic instructions above should be sufficient. To upgrade on a Mac using the ZIP package you use the “open package” Finder menu command on the Calibre2Opds application, and then replace all the files in the Contents/Resources/Java folder with the files in the ZIP archive. You will then need to change the rungui.sh file so that is set to be an ‘executable’ file. To make it executable, open a terminal window and drag the icon of the folder where the file lives into the terminal window. That will cause the path to the folder to be displayed in the Terminal window. After that, double-clicking on rungui.sh will execute it as a shell command and it will start up calibre2opds. Do I need to install the original calibre package (http://forme.emibre.com/2011/01/calibre-on-a-headless-ubuntu-server/) first? I have a huawei tablet ebook. Calibre2opds is completely independent of Calibre; it doesn’t need it to generate catalogs, only the data in the Calibre library (metadata.db and the ebook files). So the basic answer is no, you don’t need this package. Of course, to generate the data, you’d need to run Calibre somewhere. But that can be done on another computer. I don’t understand why you specify the type of ebook reader you intend to use your catalogs with… The catalogs should be generated on a desktop computer running calibre2opds, and then published somewhere your tablet can access them, and not generated on your ebook reader. I hope my answer is clear, and helps you. Comment again if you need more clarifications ! Please, where can i find the .dmg file ? Useless unstructions: There is NO install.sh file in the .zip file!